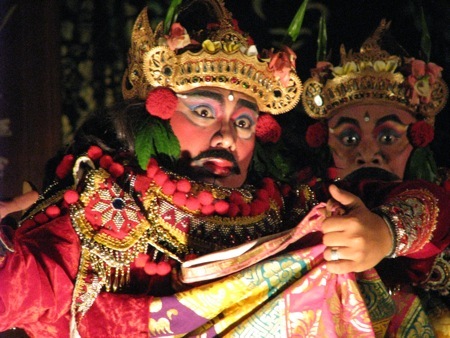 Balinese theatre and dance are intimately linked. Indeed Balinese use the same word – sesolahan – for both. Until the conquest of Bali in the early twentieth century and the arrival of Europeans, almost all performance was dramatical, often involving a combination of dance, singing and acting that went on all night, and drawing upon a vast literary canon which included Indian and Indonesian epics and stories from elsewhere. Europeans however wanted short attractive pieces without narrative or dialogue that required no cultural background or understanding. So Balinese distilled pure dance from the existing theatrical and religious performance, and choreographed entirely new pieces – so creating one of the world’s most vibrant and spectacular virtuoso dance repertoires. Although now virtuoso dance is widely taught at the national conservatoires, it is the many genres of theatre that Balinese themselves watch. And many of the great dancers come from a theatrical background, most notably Arja, Balinese dance-opera which is exceptionally demanding as it requires performers to be first class singers and actors as well as dancers. While it little known outside Bali, it is theatre which provides the vast and dynamic reservoir of talent and ideas which drives Balinese performance as a whole. The range of theatre or drama genres in Bali is remarkable. Perhaps the best known is shadow theatre, Wayang Kulit, which usually draws upon the Indian epic, the Mahabharata. Among the older forms are Gambuh, plays with chanting set to music using distinctive long flutes; and Wayang Wong, masked drama drawing upon the Ramayana. There are also various forms of Topèng, masked theatre, which use a wide range of literary sources. Of a more religious nature, Calonarang stories are used in temples and at times of public danger or pestilence. Among Balinese audiences though three genres are widely popular. The most long-lasting has been Arja, dance-opera or sung dance-drama, noted for its arias sung in a range of classical metres with unique haunting tones. Arja is highly versatile and can draw upon classical texts, popular stories or even Greek tragedy. 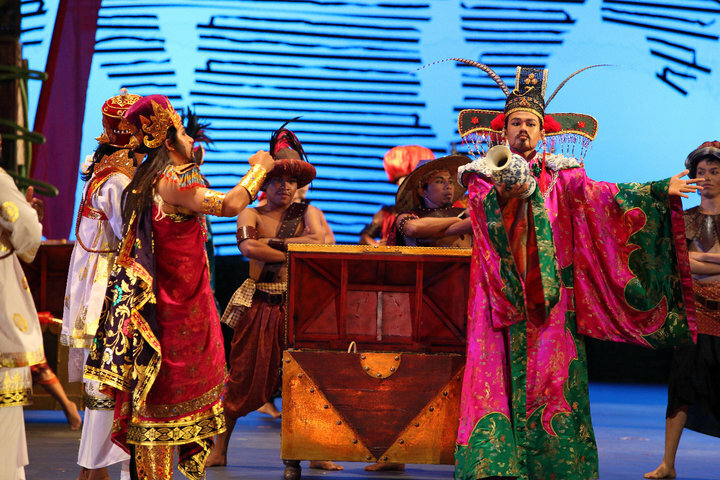 Drama Gong is popular theatre in colloquial Balinese which sprang up in the late 1960s. The most spectacular form, also dating from the 1960s, is Sendratari, mass ballet, suited for large stages with big casts who mime movements to dialogue by a dalang, or ‘puppeteer’. Although often danced to big gamelan (orchestras), Sendratari may equally use Kècak, Balinese interlocking vocal chant. 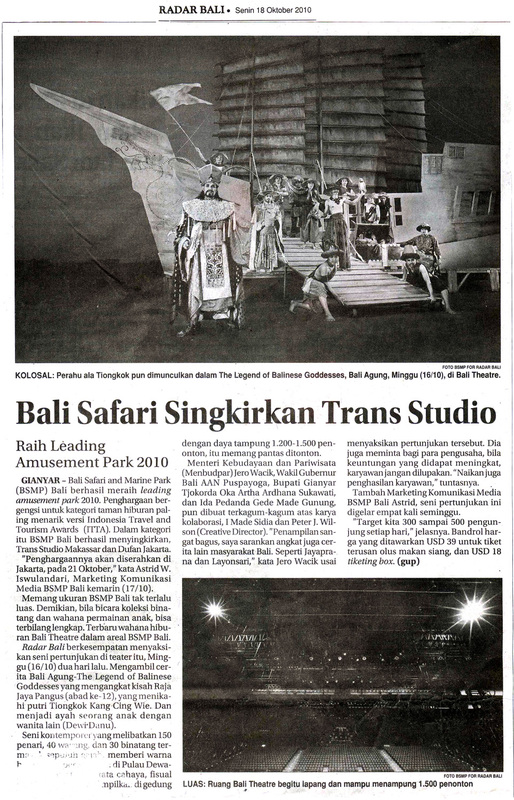 A month after the soft opening, Bali Safari and Marine Park conducted grand opening of Bali Theatre. Inaugurate by Ministry of Culture and Tourism Republic of Indonesia, Ir Jero Wacik SE on Saturday, October 16, 2010. As one part of the Taman Safari Indonesia who has been concerning on animals conservation this time made a breakthrough in efforts towards cultural conservation. Bali Agung performance lifted the ancient Balinese legend featuring 150 dancers, 40 puppets, and more than 30 animals including ten elephants at one mega stage 80 x 40 meters. The story was retelling the legend of Balinese Goddesses from 12th-century king Jaya Pangus who married a Chinese princess, Kang Cing Wie, and the father of a child with another woman is considered a goddess of fertility Bali, Dewi Danu. The event was attended by Frans Manansang the Director Taman Safari Indonesia, Vice Governor of Bali Anak Agung Puspa Yoga, Head Regent of Gianyar Tjokorda Oka Artha Ardna Sukawati, Mayor of Denpasar Ida Bagus Rai Mantra and other governmental body. Bali Theatre is the island’s premier indoor theatrical complex built to international standards in stage settings, state-of-art lighting and sound systems, luxurious seating, spacious lounge and other modern facilities. It is located in the heart of Bali Safari Marine Park along the newly developed seaside highway, Jalan Ida Bagus Mantra, on Bali south-eastern coastline of Gianyar. The theatre brings a whole new experience to theatrical art performances by accommodating a combination of traditional and contemporary dance, modern puppetry, and live animal parades. All this is highlighted with a combination of three different melodic influences. 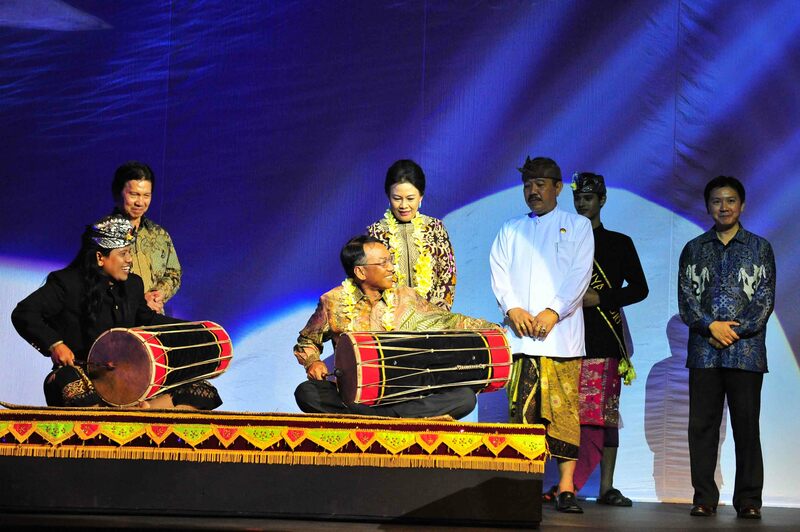 Specially written music is performed by a western orchestra accompanied by a live Balinese pentatonic gamelan ensemble and loud Chinese cymbals and drum. This is an entirely new concept which adds to the show without in any way diminishing its Balinese cultural heritage. The massive collaboration of 150 performers mirror every aspect of the island’s historic past. Its story retells an epic Balinese tale with scenes of the island’s paradise, its royal atmosphere and the magical forests that are the settings for the romantic and heroic scenes. The main stage is separated from the audience by a river pond, with boat skippers voyaging on it. The mega-stage setting transports the audience into a timeless journey and through a magical performance that shows the true colours of the island as it was several hundred years ago.